As some of you know, I have been attempting to create a Great Movie Ride movie marathon for my house by collecting every film that is depicted in the Great Movie Ride, prior to the finale. This has been a journey for me, and though I am not closer than I was a while back, one of the true thrills of my quest has been viewing Singin’ in the Rain. I must admit that this film was not high on my list of films to purchase, but we found a copy and I sat down one night with low expectations. Afterwards, I can remember sitting on the couch mumbling, “wow.” It was a masterpiece from beginning to end, and for weeks afterward I would start conversations with my wife or anyone that would listen about how brilliant Gene Kelly was. Obviously, I was a little late to the party. 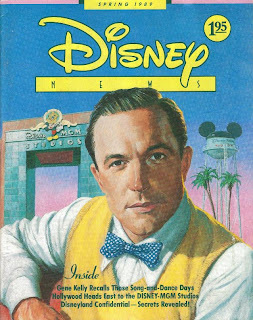 In the Spring 1989 the Disney News ran an article showcasing Gene Kelly. The piece, written by Leonard Shannon, is full of fantastic anecdotes and wit and glimpses into history, and shows what an impact he has had on the film industry and Disney, right up to and through the current High School Musical phenomenon. Which means it is definitely worth a look. About once a month, as he’s done for several years, Gene Kelly lock the front door of his house and sets out to entertain a thousand or so of his fans. They’re waiting for him at colleges and conventions all over the country, ready to spend an evening watching clips from his movies, listening to him talk about his life and good times, and finally peppering him with questions. “It keeps me in touch with the public,” Kelly explains. “I address a very general audience. Older people. Movie buffs. People who are interested in musicals and dance. Lots of college kids study studying dance and film and theater. The result, of course, has proven to be his most famous dance in what is widely regarded as the best movie musical ever made. “At the time,” Kelly recalls, “we had the title and the song, but no dance. The song had been around MGM for years. Cliff Edwards sand in it ‘The Hollywood Revue’ of 1929. Jimmy Durante had a go at it in the 1930s, and Judy Garland did it her way in the 1940s. “I wondered where, or how, to introduce the number into the picture. It had to be raining, I had to be singing, I had a glorious feeling, and I was going to be happy again. “Singin’ in the Rain” was the eighteenth of 26 movies Kelly made for MGM. Seventeen of them were musicals, putting him on a par with Fred Astaire and inviting comparisons that still abound. “When I came to the movies, I wanted to dance in T-shirts and blue jeans. Some critics claim that’s my only contribution, and maybe it is. But if I put on an evening suit, I look like I’m dressed up for the Plumber’s Ball. Fred Astaire, now, looked so good in evening clothes, you’d think he’d invented them. It was “Anchors Aweigh,” in which Kelly performs a hornpipe with Jerry, the cartoon mouse, that led to his long friendship with Walt Disney. In another respect as well, “Xanadu” occupies an important place in Kelly’s present activities. The musical numbers were choreographed by Jerry Trent and Kenny Ortega. When the picture was finished, Kelly was signed by producer/director Francis Ford Coppola to head up a team of creative filmmakers recruited for the lavish, imaginative musical “One from the Heart.” Among them was Kenny Ortega, and as time went on the young choreographer became Kelly’s protégé. They are collaborating on an original musical film which Ortega would direct and Kelly would produce. They plan to shoot it at the DISNEY-MGM Studios in Florida. Television, once the mortal enemy of motion pictures and which helped kill off the kind of musicals that he, Fred Astaire and others made, has become Kelly’s friend. For nearly every one of the past 30 years, he has been involved in major TV productions as a creator, writer, producer, director, actor, dancer, host, guest star, or narrator – and sometimes in several of those capacities at once. I’m reminded of an incident that happened while I was visiting London for the coronation of Queen Elizabeth II,” he says. “I was in chapel Street, walking toward Hyde Park corner. It was raining, and the streets were packed with millions of people who had come from all over England to see the Queen. It was cold, and I had my head pulled down in my coat. I was feeling kind of miserable, actually. “Suddenly a voice came over a loudspeaker system and said, ‘Good morning, folks. Let’s cheer it up like Gene Kelly, with ‘Singin’ in the Rain.’ ’ And out of everywhere came my song, millions of voices strong. And I was standing right in the middle of it, unrecognized, unsure of how to react. But during that presentation, one distinguished colleague disagreed with Kelly’s version of how his best-known dance originated. “I remember in the early 1950s,” said Steve Martin (who would have been about eight years old at the time. “I was visiting the set of ‘Singin’ in the Rain.’ Kelly was complaining that he couldn’t continue shooting due to the incessant rain. Nobody laughed harder than Gene Kelly. I can't believe you put off seeing Singing in the Rain. It is by far one of the best movies ever made. It's one of the first non-Disney (maybe the first) movies I showed my daughter. She didn't like the talky bits so much (she was five months), but her eyes lit up whenever the singing... and especially the dancing... started up. "Moses supposes his toeses are roses, but Moses supposes erroniously..."
I still wake up my children singing "Good morning, good moooooooorning" every day. Truly a masterpiece. Glad you've had the chance to enjoy it. I think it was one of those movies, like Casablanca and Romeo and Juliet, that my mother just went on and on about when I was a child so I was determined to not like these movies. And part of not liking them was not watching them. Oh how I regret the wasted years!